Research Grants Program is now open for applications. Click HERE to login or register for access to the online application portal. 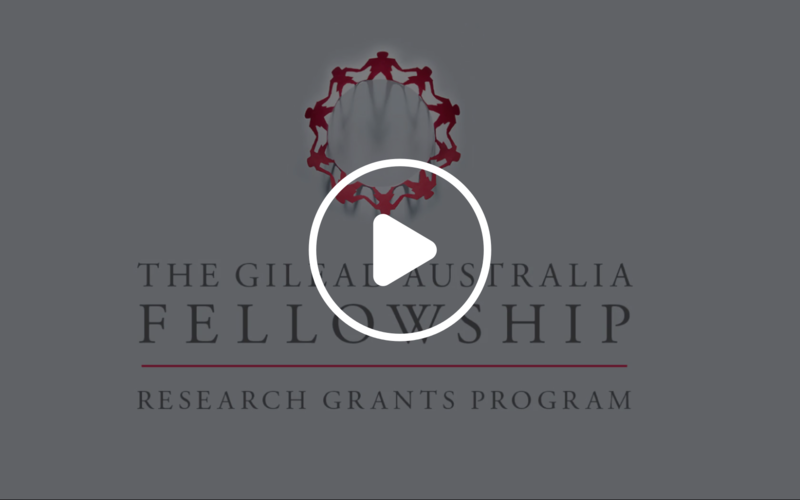 The Gilead Australia Fellowship: Research Grants Program is a funding initiative for Australian researchers. Click below to view how previous Fellowship grant recipients are working to improve patient care in the areas of HIV, chronic viral hepatitis and haematological oncology. This Policy explains how Gilead Australia Pty Ltd manages personal information that it collects, holds, uses and discloses. The primary purpose of this policy is to ensure compliance with all relevant privacy legislation in accordance with the Australian Privacy Principals (APP). This policy addresses Australian Privacy Principle 1.2 which obliges Gilead to take such steps as are reasonable in the circumstances to implement practices, procedures and systems relating to Gilead’s functions and activities that will ensure that Gilead complies with the APPs and enable Gilead to deal with inquiries or complaints from individuals about Gilead’s compliance with the APPs. This policy applies to the collection, use and disclosure of personal information about any person by Gilead personnel. Where the collection or handling of your personal information by Gilead Australia is subject to the Privacy Act, Gilead Australia must comply with the requirements of that Act. The Privacy Act regulates the manner in which personal information is handled throughout its life cycle, from collection to use and disclosure, storage, accessibility and disposal. information about the research projects and clinical trials you may be involved in. Gilead Australia will collect personal information only by lawful and fair means. When Gilead Australia collects personal information directly from you, we will take reasonable steps at or before the time of collection to ensure that you are aware of certain key matters, such as the purposes for which we are collecting the information, the organisations (or types of organisations) to which we would normally disclose information of that kind and how to contact us. For example, where personal information is collected on a form, we will generally include a statement on the form which sets out these details. online directory providers or providers of customer contact databases. Where Gilead Australia collects information about you from a third party, we will still take reasonable steps to ensure that you are or have been made aware of the key matters set out above. to manage our relationship with you including, for certain directors or employees of, or consultants to, Gilead Australia, managing your participation in equity incentive plans. the use or disclosure is otherwise permitted by the Privacy Act. Gilead Australia may also disclose personal information to parties involved in a prospective or actual transfer of Gilead Australia's assets or business. any financial payments made or non-monetary benefits given to third parties as directed by you. Gilead Australia will disclose the Transparency Data to its related bodies corporate including related bodies corporate located outside Australia. In accordance with the MA Code, or other applicable international regulations, Gilead Australia and/or its related bodies corporate will also publically disclose some or all of the Transparency Data. Specifically, in accordance with the transparency obligations in the MA Code, Gilead Australia will publish as much of the Transparency Data as required and in a manner which individually identifies you on the http://www.gilead.com/about/worldwide-operations/australia for three years from the date of publication of that information by Gilead. Gilead Australia will give you an opportunity to review and submit corrections to the Transparency Data before Gilead Australia publishes that information. You are responsible for obtaining any necessary approvals (eg, from your employer or professional body) for Gilead Australia and its related bodies corporate to collect, use and disclose the Transparency Data as described above. By accepting payment or a non-monetary benefit from Gilead Australia, you expressly consent to the collection, use and disclosure of the Transparency Data by Gilead Australia and its related bodies corporate as described above. If you do not want the financial payment or non-monetary benefit provided to you by Gilead Australia publically disclosed, you should not engage in the relevant services/activities/events or accept any services and benefits from Gilead Australia. From time to time, Gilead Australia may provide you with marketing material about Gilead products and services that we think may be of interest to you including by email, SMS and telephone call. If you do not want to receive information about Gilead products and services, you can withdraw your consent at any time by contacting the Privacy Officer, Gilead Sciences Pty Ltd, at the address below or by unsubscribing using an unsubscribe facility in an email or SMS. protect the personal information that we hold from misuse and loss and from unauthorised access, modification or disclosure. We retain personal information that we hold for as long as it is necessary to perform the function in relation to which the information was collected. We may also retain personal information for longer periods to comply with legislative requirements for document retention. Gilead Australia will generally provide individuals with the option of not identifying themselves when entering transactions when it is lawful and practicable to do so. However, we may not always be able to do this. Gilead Australia will not use Commonwealth government identifiers, such as Medicare numbers, as its own identifier of individuals. We will only use or disclose such identifiers in the circumstances permitted by the Privacy Act. Some organisations to which we disclose personal information may be located, or may store information on computer servers, outside Australia. Gilead Australia stores personal information on servers in the United States of America, the United Kingdom and Ireland and shares personal information (including Transparency Data) with personnel of Gilead Australia's related bodies corporate in Europe, Asia, South America and North America (a list of countries in which Gilead Australia has related bodies corporate can be found at http://www.gilead.com/about/worldwide-operations). Gilead Australia may also disclose your personal information to overseas regulatory authorities, overseas event/conference organisers, international clinical trial sites and, where Gilead Australia may be organising travel on your behalf, overseas travel agents. As discussed above, Gilead Australia's related bodies corporate may also publically disclose some or all of the Transparency Data as required under applicable international regulations. If you are a director or employee of, or consultant to, Gilead Australia and participating in Gilead's equity incentive plans, your personal information may also be transferred to a stock plan service provider located in the United States of America. If Gilead Australia transfers your personal information to another party outside Australia, we will take such steps as are reasonable in the circumstances to ensure that the overseas recipient will not breach the privacy principles set out in the Privacy Act in relation to the information. Please contact Gilead Australia if you would like to access or correct the personal information that we hold about you. Gilead Australia will generally provide you with access to your personal information if practicable, and will take reasonable steps to amend any personal information about you which is inaccurate or out of date. In some circumstances, Gilead Australia may not permit access to your personal information, or may refuse to correct your personal information, in which case we will provide you with reasons for this decision in accordance with law. Please contact us if you have any queries about the personal information that Gilead Australia holds about you or the way we handle that personal information. Our contact details for privacy queries are set out below. Privacy Officer, Level 6, 417 St Kilda Road, Melbourne, Victoria, 3000. Telephone: (03) 9272 4400. Facsimile: (03) 9272 4435. Further information about the application of the Privacy Act to the private sector generally can be found at the website of the Office of the Australian Information Commissioner at www.oaic.gov.au. Please contact us if you have any concerns or complaints about the manner in which your personal information has been collected or handled by Gilead Australia. Our contact details for this purpose are set out below. Gilead will respond to your concern or complaint within a reasonable period of time. It is our intention to use our best endeavours to resolve any concern or complaint to your satisfaction. However, if you are unhappy with our response, you may contact the Office of the Australian Information Commissioner (see the details above).